This review was written for the Egremont 2Day newspaper in March 2015. Fancy a night out? How about a couple of pints down at Keswick’s Theatre by the Lake? You’ll be served by a cheery landlord and his wife and the characters coming and going are a real treat. 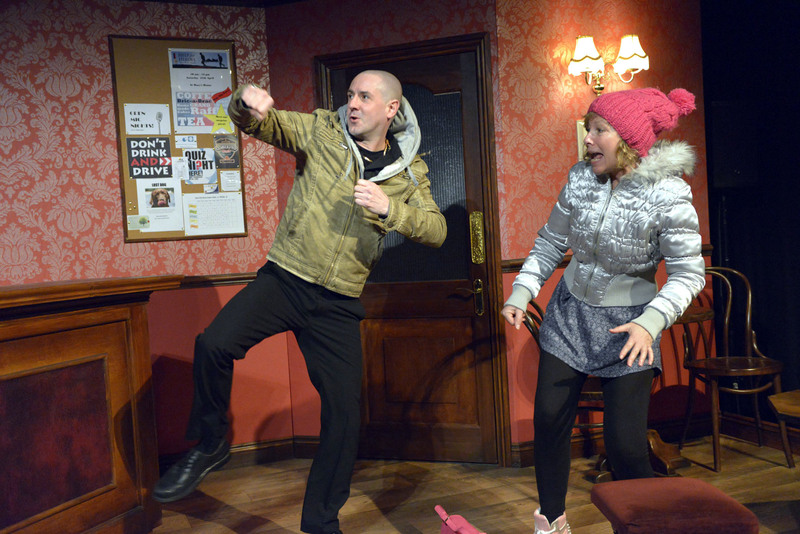 At least that’s the case if you go to the theatre’s cosy studio stage for Jim Cartwright’s excellent play, Two. The play is cleverly choreographed so that the two actors change roles as if in a dance. Ducking and diving, in and out of doors, sometimes they take roles together, other times it’s a monologue. It may only be two actors on the stage but it feels like a crowd. The Landlord and his wife are the bedrock to the whole play and we see their story gradually unfold throughout the performance until it reaches the inevitable bitter-sweet end. Each role gives us a different perspective on life without making judgement. Sometimes sweet, sometimes nothing but sour. But every time, as we laugh and cry with the characters there is some aspect of their lives which strikes a chord in our own. Perhaps my only criticism is of the last character to be introduced. Addis plays the role well and Birkett does her best with the script but I think it is the author, Cartwright, who doesn’t get it quite right here and the result is a little bit farcical when really pathos is called for. A shame, it is perhaps the most important character of all. But this is a minor quibble for the play as a whole stands up remarkably well. It is enjoyable, fun and moving in equal measure. ‘Most impressive moment’ award goes to Addis as he demonstrates a landlord’s ability with a stag do. I’ve known barmen like this and the actor pulls it off hilariously well. It’s almost worth going just for that wonderful moment of comedy. I thoroughly enjoyed Two and I’m pleased to see it will be on tour in Cumbria after the run finishes at the theatre on Tuesday 14th April. It will play to a number of small venues (details at www.theatrebythelake.com or call the Box Office on 017687 74411) from 16th to 25th April though not, alas, any pubs. What a shame – it would be perfectly set!